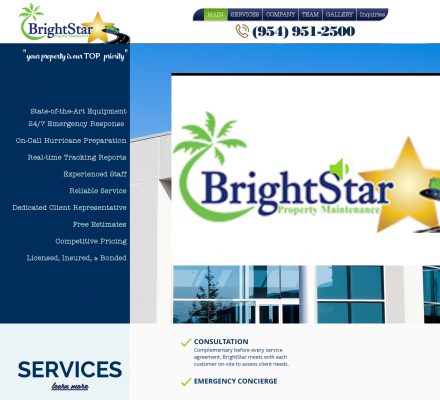 BrightStar Property Maintenance provides an array of professional maintenance services, customized to each property’s specific needs, with 20 years of experience. Though we are a one-stop shop for commercial maintenance, no two properties are identical so giving blind service to any client goes against the BrightStar service initiative. We specialize in parking lot sweeping, commercial power washing, construction clean up and porter service in Miami Dade, Broward and Palm Beach counties. Description: Home, Home Improvement - BrightStar Property Maintenance Inc. BrightStar Property Maintenance provides an array of professional maintenance services, customized to each property’s specific needs, with 20 years of experience. Handymanwire (Popularity: ): Collection of articles, tips, FAQs, and forums for a variety of home improvement projects. Mr Fix-It Inc (Popularity: ): Advice on home repair, home improvements and many do-it-yourself projects. Home Repairs (Popularity: ): Home repair tips, discussion forum and contractor search utility. DIYData.com (Popularity: ): Collection of short articles on topics including plumbing, painting, tool usage, and other repair projects around the home. Mobile Home Doctor (Popularity: ): Short articles offering tips for repair and improvement specific to mobile homes. Includes a tutorial on construction of mobile homes. Be Constructive (Popularity: ): Illustrated plans and instructions for wood construction from a simple table to building a house. HomeImprove.com (Popularity: ): Collection of short articles on dozens of home improvement and repair topics.